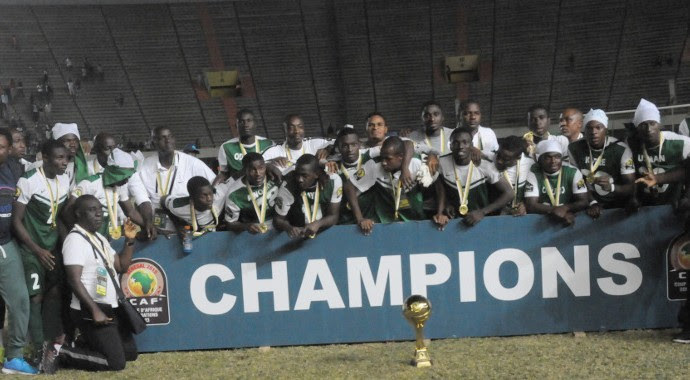 The Nigerian Football Federation has paid $500,000 to the victorious Nigeria under 23 players that won the last African u-23 championship in Senegal. On Saturday, Nigeria defeated Algeria 2-1 to become the winners of the second edition of the U23 AFCON. Each player earned $12,000 while Head Coach Samson Siasia took about $24,000. A further breakdown showed the team were paid the Naira equivalent of $4,000-a-player for the final win, $3,000-a-man for the semi-final win over hosts Senegal, $2,000-a-man for the opening-day win over Mali, and $1,000 for the draws with Egypt and Algeria. They were also paid $100 per day for the 10 days they trained in The Gambia prior to this championship, which amounted to $1,000. “All what they were owed have been sorted now,” according to an NFF official. The Dream Team, Algeria and South Africa will represent Africa at next year’s Rio Olympics.